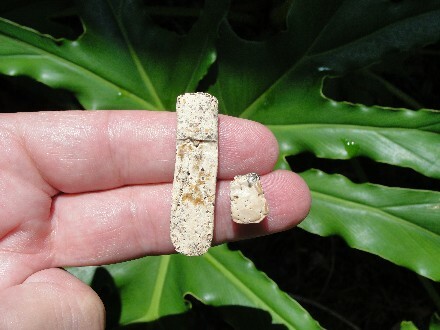 These are solid Armadillo Fossil Scutes or Osteoderms. The large one is the flex scute and the other is stationary. First-class examples of scutes from the Prehistoric Armadillo's armored plating or shell. These Armadillo's had hundreds of these scutes while alive. These detailed fossil scutes have no repairs or restorations. Sometimes called the "Beautiful Armadillo", it was a little larger than today's Nine-Banded Armadillo. Top-notch set of two different types of scutes from the same type of armadillo. Actual Specimen Pictured & Guaranteed Authentic. Dasypus bellus looked like today’s modern nine-banded armadillo (Dasypus novemcinctus, or common long-nosed armadillo), except it was much larger. The modern Nine-Banded Armadillo is a cousin, if not a direct descendant of the “Beautiful Armadillo”. Its height was 3.3 feet (1M) and it lived about 2.5 million to 11,000 years ago when it became extinct. The body armor was made up of thousands of scutes or dermal plates that can fossilize over time. This armor was a great defense against Pleistocene predators. The round holes found on individual scutes are for hair follicles. Individual scutes are found more often than whole skeletons. Each section of the body has a different type of scute. There were nine flexible bands on the carapace, like their modern cousins. Their snouts were long, round and narrow, along with their skulls. Their jaw had 7-9 peg like teeth. The extinct armadillo is thought to have migrated from South America and into Florida some 2.5 million years ago, in the Pliocene Period. An armadillo can walk across a river bottom or swim across it. 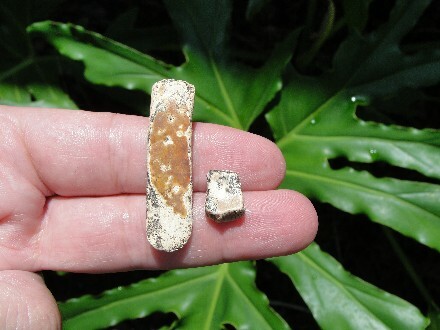 I promise to use it only to send you Fossil-Treasures-of-Florida-Newsletter.